Dutch director Paul Verhoeven rose to prominence in Hollywood with his 1987 breakthrough 'RoboCop', a brutal sci-fi film that also brought a satirical edge. The popularity of the film saw big screen sequels as well as a string of television series and other tie-ins. Yet the decision to reboot the franchise has widely been derided, and now we have the opportunity to see whether such criticism has been justified. José Padilha, acclaimed for his 'Elite Squad' action films, was brought onboard to deliver the new iteration of 'RoboCop', selecting an impressive cast to aid him - Gary Oldman, Samuel L. Jackson, and Jackie Earle Haley to name but a few. However, his vision falls short of its original incarnation - toning down both the violence and the satire, without offering much to satisfy in replacement. Joel Kinnaman portrays Alex Murphy, a Detroit police officer, who is critically injured by a carbomb in retaliation for his pursuit of corrupt colleagues and local crime boss Antoine Vallon (Patrick Garrow). Multinational tech conglomerate OmniCorp offers Murphy's wife, Clara Abbie Cornish, the opportunity for him to be part of the RoboCop programme - a new law enforcement initiative that combines man and machine. Dr Norton (Gary Oldman) outfits Murphy with his new hardware and software, which he initially struggles to come to terms with. Norton and Murphy persevere however, and he becomes an important face for OmniCorp as they seek to increase robotic law enforcement (which include the returning ED-209 model) across the US. Murphy soon attempts to track down the people responsible for his near-death but is thwarted by his OmniCorp superiors, including Michael Keaton's CEO character. Joshua Zeturner's script attempts to bring back some of the satire of the 1987 film, with Samuel L. Jackson playing a generic outraged conservative US TV host, while also touching on similarly pertinent political issues (such as drone use) as the original. Unfortunately, these aspects never fully feel fleshed out, and Zeturner also falls back on clichés far too easily with Cornish's perenially tearful housewife and Oldman's conflicted scientist being victims of this crime. Director José Padilha brings a kinetic style to the reasonably engaging action scenes, but the camera is often too jarring for comfort. The acting is similarly competent, without ever really excelling - nuanced actors like Jackie Earle Haley are reduced to one dimensional roles. 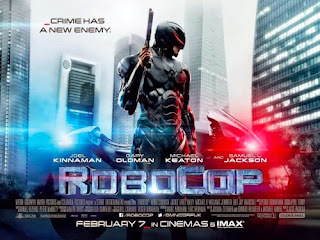 As a result, the 2014 version of 'Robocop' will certainly live in the shadow of its subversive Verhoeven predecessor, but no more (or less) so than the subsequent mediocre sequels seen in the early nineties. 'Robocop' is out in UK cinemas now, through STUDIOCANAL.